Eating a slice of the sandwich wasn't much different from eating a normal PB&J. It was more decadent and tasty than its common inspiration, but it felt to me more like eating lunch than dessert. This made it too easy to justify eating a leftover slice for dinner, thinking "there's nothing inappropriate about eating a sandwich for dinner." This lead me to think that other traditionally off limits foods could be repurposed as acceptable meals if they were simply rebranded as sandwiches. We've already seen work in this area with the Monte Cristo — a dessert by many definitions but classified as a sandwich due to the presence of deli meats and its similarity to a croque-monsieur. I believe the secret to this happy deception is in the bread. Here at It's What's Between, we often neglect bread, hence the name of the blog. Yet there's no denying that pound cake as bread could be a gamechanger. I've seen donuts used as bread, but you and I know in our hearts that they're outside the realm of sandwichstuff credibility. Would brownies as bread be out of the question? Probably. I think any substitute dessert needs to at least resemble the real McCoy. So what makes the cut? Pound cake clearly passes, as does the Monte Cristo's French toast. Waffles and pancakes are also suitable; consider the breakfast sandwich. Beyond these examples, I'm stumped for now, but I'm convinced there are others out there. Do you have any ideas? This could be big. We're talking a sandwich revolution here. Yay!!! Lots of intriguing thoughts on the fine line between desserts and sandwiches. The bread may, in fact, make all the difference. I believe I also ate a few pieces of this as a meal instead of a dessert....though after eating real pb and j for lunch, I wasn't much in the mood to eat the cake form of it after work, so it was reserved for a weekend snack. 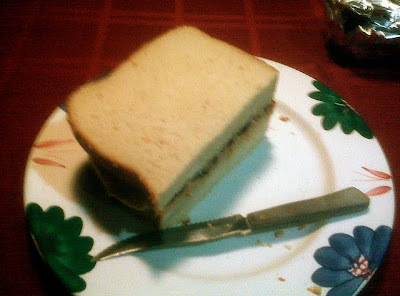 Peanut Butter Jelly Time is now firmly stuck in my head ;) Peanut butter jel-ley!